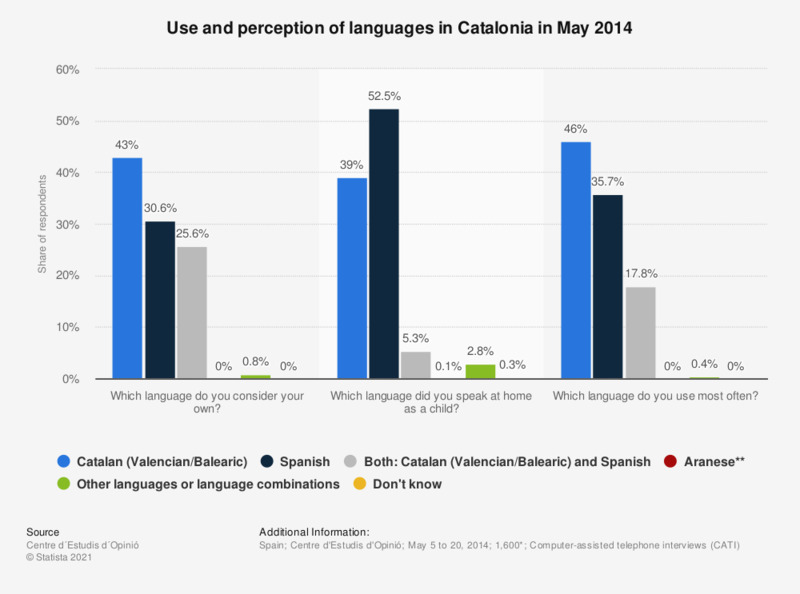 This statistic represents how people living in Catalonia use and perceive their languages according to a survey carried out in May 2014. Although over 50 percent of respondents spoke only Spanish at home when growing up, in 2014 Catalan alone was the main language of communication for 46 percent of respondents. This, as well as the fact that 43 percent considered Catalan to be their own language, represents the growth in popularity of the regional language which has undeniably played a role in the cultural and national identity of Catalans and Catalonia. ** Aranese is a dialect of Occitan with a few thousand speakers, spoken in the Vall d'Aran in Catalonia, on the border with France. It is the third official language of Catalonia. How important do you consider sharing the national customs and traditions for being truly Dutch?